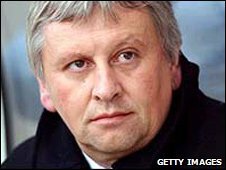 Southend United have appointed former Plymouth boss Paul Sturrock as their new manager on a three-year contract. The 53-year-old Scot, who will be assisted by Salisbury boss Tommy Widdrington, replaces Steve Tilson, who was put on gardening leave on Sunday. Tilson had been in charge for over six years but lost his job after Southend suffered relegation to League Two. The Shrimpers are facing a winding-up order at the High Court on 8 July over unpaid tax debts of around £200,000. "I'm very excited. I appreciate there's a big challenge at the football club and it's a club that's had disappointment," he told BBC Essex. "But I'm very hopeful we can bring some good players to the football club and start to push it in the right direction." He added he would use his previous experience at arriving at clubs in difficulty, such as Plymouth, Sheffield Wednesday and Swindon to turn around the Shrimpers' fortunes. "It's a formula that we've used in the past and I'm not going to change or break the mould," he said. "We're going to attempt to win football games in the way we've won games in this league in the past and we've got to bring in the personnel that will benefit us in that." There are certain players making a bee-line for this club as we speak. So we are on the ball as far as that's concerned. Sturrock arrives at Roots Hall with a squad of just 10 professionals on Southend's books and is unable to add to that with the club currently under a transfer embargo because of delays in paying players' wages. He admits he is "a little light of players" but says he has received assurances from chairman Ron Martin that the embargo should be lifted "very quickly". "We've had a discussion about the timeframe for this embargo and I'm comfortable with what's been mentioned," he said. "The important thing for me is I've got to put a lot of people on standby and have the gift of the gab to persuade certain players to come to this club in the circumstances and situation we're in at the minute. "There are certain players making a bee-line for this club as we speak. So we are on the ball as far as that's concerned. "We cant afford to be too long with this for the simple reason that everyone else is chasing the players I'm chasing, so it's very important we get that done as soon as possible." He also revealed both he and Widdrington had yet to sign a contract, but would do so "in the next two to three days". "The time frame has been very, very quick, so Tommy and I have discussed our terms and have come to an agreement," he said. A manager of Paul Sturrock's calibre is no mug. So why would he come to Roots Hall unless RM has been able to prove that there is a financially stable future for The Shrimpers? "But the important thing was being at this football club as quickly as we could, due to the lack of time until the start of the season. "So we've turned up here and needed to work very, very quickly on benefitting the club before we sorted out contracts." Sturrock joins the Blues after his second stint at Home Park came to an end in April. In his first spell with the Devon club he had taken them from the bottom of the Football League to the brink of the First Division in 2004. After a six-month spell at then-Premiership side Southampton, he spent time at Sheffield Wednesday and Swindon before rejoining Argyle in 2007, where he guided them to 10th in the Championship. He was relieved of his managerial duties in December 2009, but stayed in a business support role until his departure in the spring of 2010. Sturrock's new assistant at Roots Hall, Widdrington, joined Salisbury City as a player in 2005. The 38-year-old former Southampton midfielder became the Whites first team coach in July 2009. A 10-point deduction restricted the Wiltshire club to a mid-table finish in the Blue Square Premier, but they would have finished sixth without the penalty. They were demoted two divisions at the end of the season for breaking Football Conference rules.